Tau Kappa Epsilon is a Fraternity for Life. It's important to stay involved and connected with the Fraternity even after you graduate. TKE would not be the successful Fraternity that it is today without the tireless efforts of our many alumni volunteers. In this guide, you will find information on how to stay involved with your chapter and how you can contribute your time and talents beyond your own chapter. The Official Alumni Resource Guide highlights ways to get involved, stay connected, attend programs, join an Alumni Association, and how to contribute your other talents to assist TKE Nation. Additionally, this guide provides information about the Life Loyal Teke program and ways to support the TKE Educational Foundation. 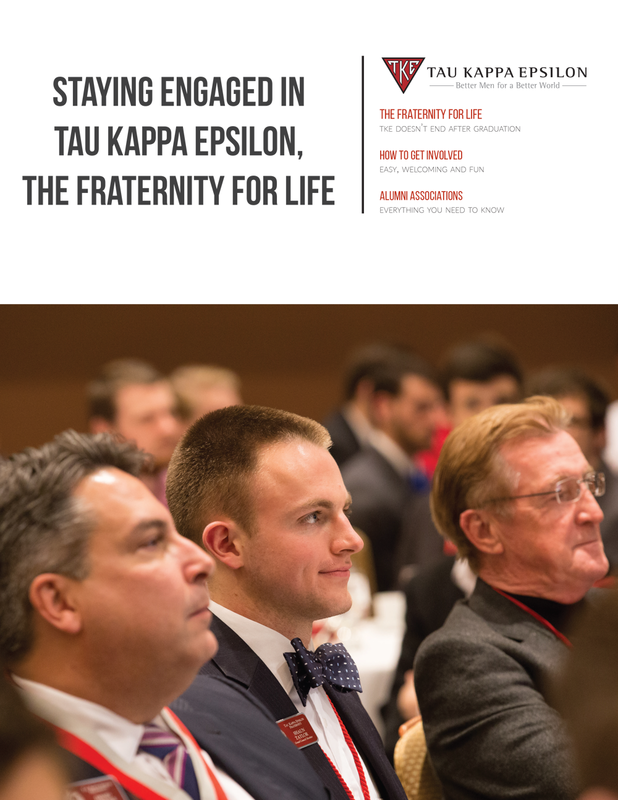 Download the Staying Engaged in Tau Kappa Epsilon, the Fraternity for Life. Click the image below to download "Staying Engaged in Tau Kappa Epsilon, the Fraternity for Life"